Lice Medication Poisoning is the accidental or intentional intake of any product containing the compound. The exposure may occur following skin/eye contact or swallowing of the product. What is Lice Medication Poisoning? What are the Causes of Lice Medication Poisoning? What are the Signs and Symptoms of Lice Medication Poisoning? The signs and symptoms of Lice Medication Poisoning can vary from one individual to another and it also depends on the type of head lice medicine used. It may be mild in some and severe in others. Several systems of the body, such as the respiratory system, digestive system, nervous system, skin and ENT may be affected. How is First Aid administered for Lice Medication Poisoning? Who should administer First Aid for Lice Medication Poisoning? 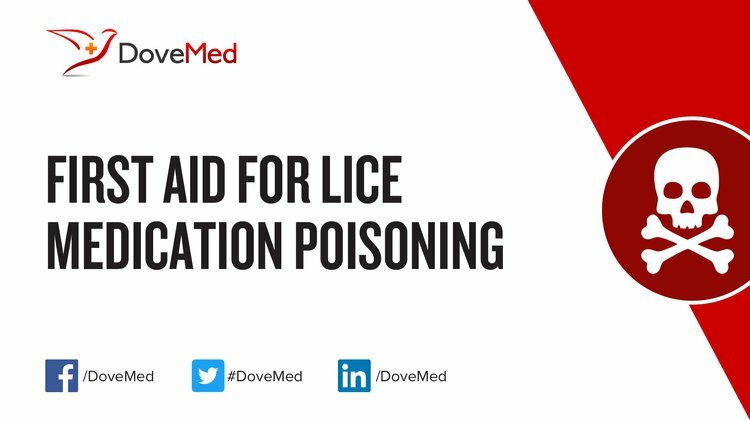 First aid for Lice Medication Poisoning is administered by healthcare professionals. What is the Prognosis of Lice Medication Poisoning? How can Lice Medication Poisoning be Prevented? Nolan, K., Kamrath, J., & Levitt, J. (2012). Lindane toxicity: a comprehensive review of the medical literature. Pediatric dermatology, 29(2), 141-146. Meinking, T. L., Villar, M. E., Vicaria, M., Eyerdam, D. H., Paquet, D., Mertz‐Rivera, K., ... & Reyna, S. (2010). The clinical trials supporting benzyl alcohol lotion 5%(Ulesfiatm): a safe and effective topical treatment for head lice (Pediculosis humanus capitis). Pediatric dermatology, 27(1), 19-24. Tebruegge, M., Pantazidou, A., & Curtis, N. (2010). What9s bugging you? An update on the treatment of head lice infestation. Archives of Disease in Childhood-Education and Practice, edpract178038. Feldmeier, H. (2012). Pediculosis capitis: new insights into epidemiology, diagnosis and treatment. European journal of clinical microbiology & infectious diseases, 31(9), 2105-2110. Frankowski, B. L., Bocchini, J. A., & Council on School Health and Committee on Infectious Diseases. (2010). Head lice. Pediatrics, 126(2), 392-403.
van der Wouden, J. C., Klootwijk, T., Le Cleach, L., Do, G., Vander Stichele, R., Knuistingh Neven, A., & Eekhof, J. A. (2011). Interventions for treating head lice. The Cochrane Library. Wananukul, S., Chatproedprai, S., Tempark, T., & Wananukul, W. (2011). Clinical response and safety of malathion shampoo for treatment of head lice in a primary school. Journal of the Medical Association of Thailand, 94(4), 465. Heukelbach, J., Oliveira, F. A., Richter, J., & Häussinger, D. (2010). Dimeticone-based pediculicides: a physical approach to eradicate head lice. Open Dermatol J, 4, 77-81.